I suppose I should give everyone an update on the activities of our family this past couple of months. Rebecca is playing 9th grade basketball and is the captain of the team and the point guard. Marty wrecked the Tundra on a rainy day on the way home from school. It has already been repaired. I don't know the status of the Mercedes Benz that he struck. Hopefully he has learned a valuable lesson without harming anyone. Eric is having a great year in 4th grade. Angie's missionary boyfriend came home from Fiji yesterday. The other boyfriend is still around. Something has got to give. Stay tuned. 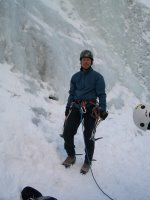 I have ice climbed once this year. A couple of days I have been on some great rock climbs in the area. Oh, yeah....I had my first kidney stone. My definition of pain has changed. I was reduced to a crawling, writhing idiot. I would recommend avoiding any kidney stones if I were you. Not much snow in the mountains and I haven't been up to Brian Head yet. Still with the Deacons. We are going on a camp-out this weekend. Eric will be joining me. Once again I invited Marty to come along and once again I was flat out rejected. Looking forward to seeing Sheri and Peter at Christmas. Often my days off during the week ,inbetween shifts at the hospital, are filled with mountain bike rides and climbing sessions. This always keeps me sane and physically fit.